I am so lucky that my children are like their mummy because they enjoy reading books just as much as I do, so whenever I get the ooprtunity to review books, I always accept. Recently I was sent two new books from Macmillan Children's Books, one was more for Gracie's age group and one was more for Layla and Gracie in my opinion. First up was a new twist on the classic book, Dear Zoo, one of my all time favourite books which has sold over 5 million copies!! 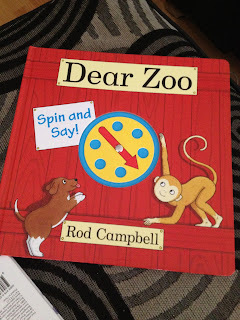 Now it is time for Dear Zoo Spin and Say! to make it's mark. This new board book features he favourite animal friends from the original book as well as some new wild animals and pets. It draws you in immediately with it's bright colours, Rod Campbell has illustrated the book well, he seems to know just how to get children engaged with what they are looking at. The book contains two spinners inside, so as well as being able to look at pictures and read the texts, your children can really get involved with what you are reading with them by spinning the wheel. I think it adds a little more excitement into the book because you can play a guessing game as to where you think the wheel will stop next. Layla was keen to get her little hands on the spinning wheel and find out what it was all about. On each page there is a different question which leads you to ask how many, what animal, what colour? What is nice is, the wheel obviously won't stop on the same answers each time, so it is like you are reading a new story every time you open up the book to look at it. It is a simple concept : spin, point and say. 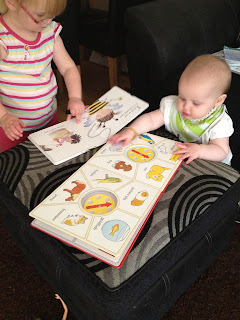 I think it helps little ones in learning first words, numbers and colours and is a great activity for a parent and child to sit down and do together. I was impressed at just how sturdy the book was, my children are known to be more than a little heavy handed shall we say, so to have a book that won't be easily torn or broken is a big bonus in this house. This book has taken a well known classic and managed to expand on it and if you haven't read the original Dear Zoo before, I would definitely recommend buying that as well as Dear Zoo Spin and Say as I think both books work well together!! 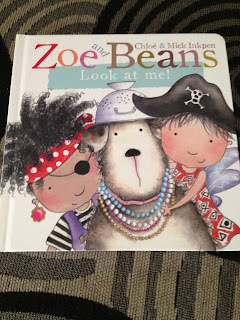 Next up was a new book to the lovely Zoe and Beans series. I had heard of this series before but had never had the chance to read them so I think I was just as excited as Gracie to get stuck in and have a read. The text flows nicely with rhyming words and the illustrations that accompany the words are adorable. The pictures allowed me to ask Gracie questions about the book, asking her what colour a certain picture was, or where an item was on the page. I think the book would work well for both toddlers and young children as you can start off by just imagining what is happening in the story by looking at the images and then as they grow, you can start helping them read the words with you. Both my five and seven year olds took the time to read this story to their little sister's too, it was lovely to see them all sitting down quietly for a change. And again, being a board book meant no ripped or bent pages, it was Layla proof!! Zoe and Beans really had Gracie giggling away, I think I know what I will be buying when Christmas comes around. The theme of the book was dressing up, which just happens to be Gracie's favourite thing to do and it seems I now need to buy her a pirate costume for her to dress up in. You can see from the picture to the right, that both Layla and Gracie were really pleased with their books. It gives you just a little peek as to what you will discover if you decide to buy these books. I do think books are an important thing to introduce into any child's life, not onlly for teaching them to read but teaching them to use ther imagination and letting you spend time together as a family. 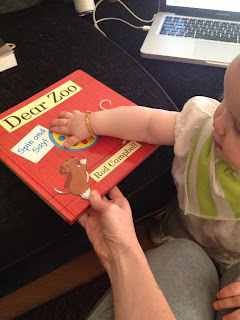 Both Dear Zoo Spin and Say and Zoe and Beans Look at me, would make great editions to start off any childs book collection. Keep an eye out on my blog because I may just have a few more book reviews coming up this month! !